What kind of child were you? Are you the first, middle, or the youngest? 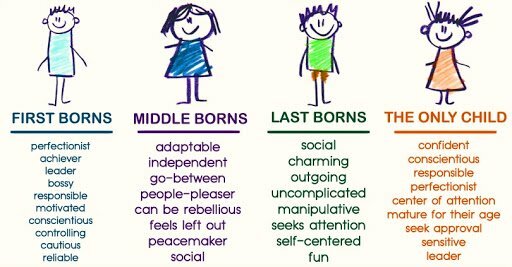 This article will show you how your birth order influences and shapes your personality as a mature adult. Every parent notices differences between their children, starting from looks, passions, and habits, to foods they like and dislike the most, and last but not least, differences in personality. Namely, children act and develop differently depending highly on their birth order. So, parents need to be aware of this so that they can have a better understanding of their children. What’s more, researchers have found unique characteristics in personalities of first borns, middle borns, last borns, and only children. When the age gap between children is big, they may take on the role of first born, rather than middle or last born. Additionally, adopted children usually fill in the role to which they are placed in the family and this determines their personality. For example, have you ever asked why your sister has her mind in a different place, painting and walking in nature instead of joining the neighborhood kids after school? Moreover, how many of your family members find you too bossy? If these situations, or similar ones, are frequent in your life, don’t worry, you’re not alone as this occurs in almost every family. Hence, birth order plays a crucial role. For example, first borns are perfectionists who are raised by parents who want to do everything right for their children. As a result of this, first bornes have a good communication with adults when they are still kids. Unfortunately, first borns tend to worry a lot and they want to be in control of things. Moreover ,they are very competitive and high achievers in all areas of life, whether professional, appearances, or school- they are dedicated workers who like to excel and achieve greatness. Some of their characteristics are perfectionists, achievers, leaders, bossy, motivated, responsible, controlling, cautious, reliable, etc.